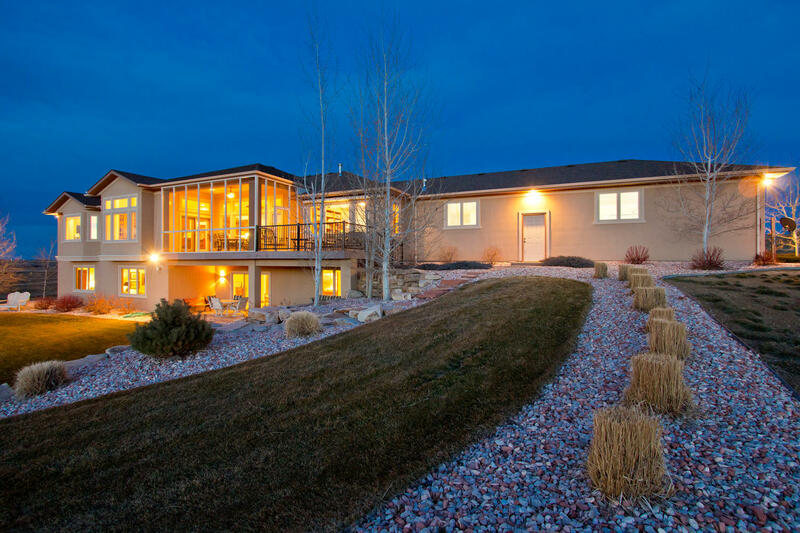 See for miles – living in a true Colorado postcard, Captivating Panoramic Mountain views all around! Gazing out to Long's Peak, picture perfect mountain views – this masterfully crafted custom ranch was designed with capturing breathtaking views! *Fine attention to detail throughout, build by Scott Oakes in 2008, resting on 4 peaceful acres. All the quality one would expect with beautiful travertine flooring, tile work, granites, onsite crafted soft-close knotty cabinetry, casing and trim, fully finished walk-out Basement – and choose your favorite activity with the Billiard Room which includes the pool table, Fitness Rm, spacious wet bar, and Theater Room which includes powered/reclining theater seats! Flexible comfortable layout at 6,110 finished square feet with 3,522 finished on the main floor and 3,450 in the lower level/Walk-out Basement. 4 spacious bedrooms or 3 and a fantastic main floor office, 2nd Bedroom on the main floor does not conform however the septic system has been sized and verified for 4 bedrooms. 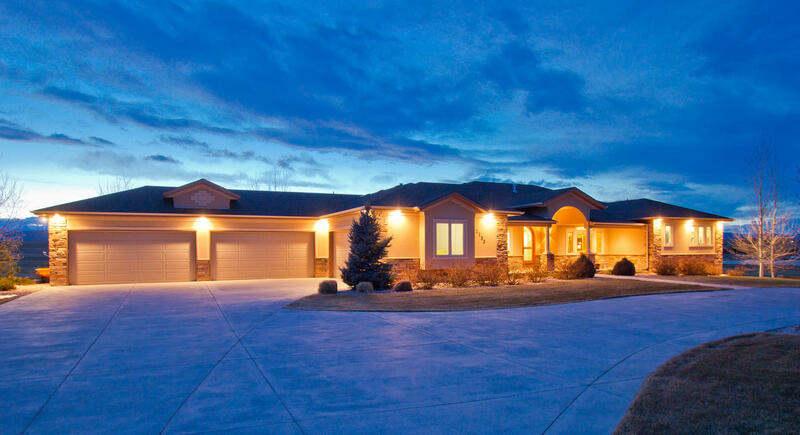 5 bathrooms, 3 stone/travertine gas fireplaces, 2 high efficiency furnaces, 2 hot water tanks with *recirculation pump – ideal for Colorado, faster hot water complete with an Active Radon System. Slip into the Colorado dream with a spa-like Master Bathroom Retreat! Oversized jetted tub, spacious shower with seat and tiled flooring, marble countertops, oil rubbed faucets and hardware. 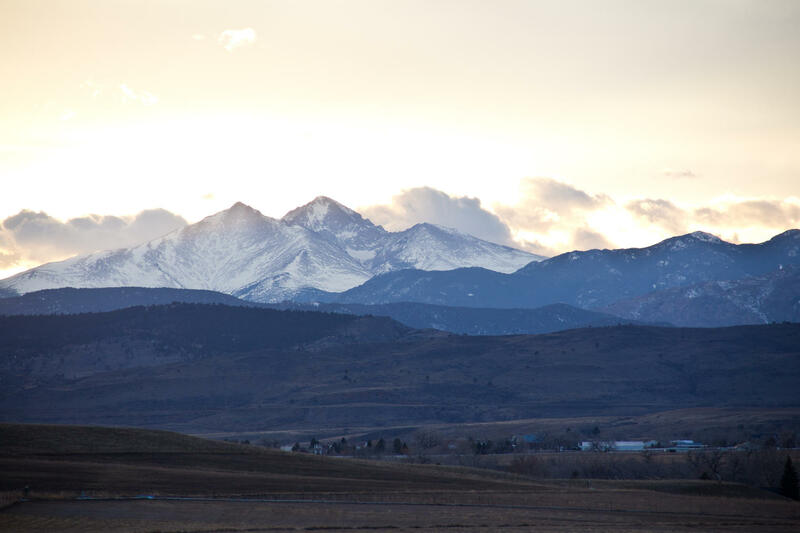 Enjoy the picture perfect unobstructed view of Long’s Peak from the Master Suite complete with its own stone gas fireplace and alder built-ins. Enormous walk-in Master closet with huge built-in island complete with soft close shelving for jewelry. Plenty of room for guests or other family members 2 bedroom suites in the lower level/walk-out basement as massive at 18ft X 16ft complete with their own walk-in closets and sets of built-ins. Lower level patio and front patio both showcase a beautiful low- maintenance stamped concrete. From out on the screened in patio at 242 sqft. entertain right off the nook and open eat-in kitchen and – have your private Colorado with Trex low maintenance deck flooring and outdoor deck features a built-in retractable awning! Beautiful Stone and Stucco exterior and curb appeal complete with an easy access circular driveway, a 50year Asphalt Composition roof and full irrigation front and back - gorgeous garden area! Enough space in this eye-popping 6 car garage to house a nice car collection! Oversized 6 car at 1,572 sqft. with volume ceilings, a shop, heater, all finished and insulated, with 9ft doors! Confirmed with Larimer Cty as minimal risk for flooding. Bridge and street to be black topped off CR4 and Mountain River by Larimer County. See lot #05 next door, 2147 Mountain River Rd. for sale at 4.5acres.